Black Canary takes flight in a 4-issue miniseries written by Tony Bedard (52, SUPERGIRL AND THE LEGION OF SUPER-HEROES) with art by Paulo Sequiera (BIRDS OF PREY, Gypsy) and Amilton Santos! The League of Assassins tracks Black Canary to Star City in an effort to liberate the child, Sin, they believe to be the DCUs next greatest assassin. 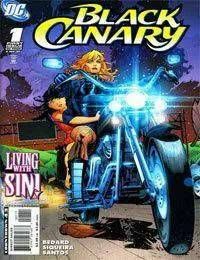 Luckily, Black Canary has other plans for Sins abilities and future.<br />While at a fast food joint with Sin, Black Canary recounts her first meeting with the Green Arrow. She had just joined the newly formed Justice League and she and Green Arrow had been tasked with protecting the Japanese Prime Minister. He was being attacked by assassins dressed like Elvis and the whole time they were fighting, Green Arrow was trying (and mostly failing) to flirt with her. Black Canary had cleaned up most of the assassins but Green Arrow shot down an arrow flying at the Prime Ministers head and got all the credit. The archer, Merlyn, got away, but the Prime Minister was safe. After the fight, Batman revealed that he had been watching the whole time. That was ten years ago.